The Information Office of the head of the National Wisdom Movement Ammar al-Hakim , Saturday, that the latter discussed with the Kurdistan Regional Government President Nigervan Barzani, the file of the formation of the government and constitutional entitlements. 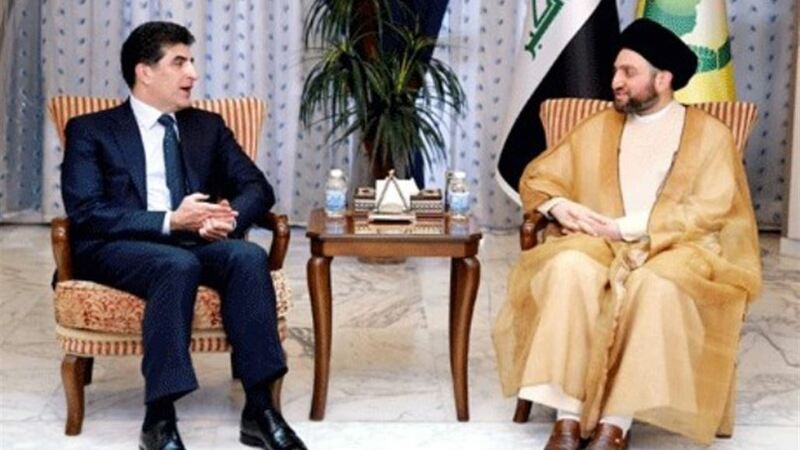 "The head of the National Wisdom Movement, Ammar al-Hakim, received, in his office in Baghdad, the head of the Kurdistan Regional Government of Iraq, Najran Barzani, and discussed with him the file of forming the government and the constitutional entitlements to come," the office said in a press release . "The importance of maintaining relations with the Kurdistan region and invoking the public interest and the national interest, and all experiences proved the need of all for all," Hakim said, calling for "the superiority of the national interest to private interests or narrow interests." And between Hakim, "the importance of resolving candidates for the post of President of the Republic and not to exceed the constitutional and legal times related to it," stressing the "need to form a strong government able to assume responsibilities and achieve the aspirations of the Iraqi people and provide services."